Dorset Web is a trading company of Radikls. We have clients across the UK and in Ireland, Australia, Indonesia, Spain, France and the United States, with many trading worldwide. In the South of England we run a number of local web businesses set up to give the client the local support and confidence that they require. In Dorset www.dorsetweb.co.uk we operate a studio in Poole which is also the head office and covers the towns of Poole, Bournemouth, Dorchester, Bridport, Weymouth, Shaftesbury and cover the counties of Somerset and Wiltshire with clients based in Yeovil, Salisbury and Taunton. Hampshire is covered by www.siteweave.net which is based in Southampton. We have Hampshire based clients in Southampton, Winchester, Portsmouth, Waterlooville, Totton, New Milton, Eastleigh, Havant and Aldershot. In Surrey our local office is in Weybridge and we operate as www.perfectpage.co.uk. Our Surrey client base covers Woking, Guildford, Walton on Thames, Weybridge, Chertsey, Farnham, Epsom and Byfleet. www.eastsussexwebsitedesign.co.uk has a base in Hove near Brighton and covers clients throughout East Sussex in Eastbourne, Brighton, Lewes, Forest Row and Hove. 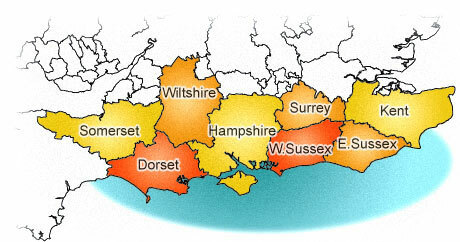 www.westsussexwebsitedesign.co.uk covers the West Sussex county and towns of Worthing, Bognor Regis, Horsham and Chichester. Kent is serviced by Waterside Designs in Whitstable and covers the towns of Canterbury, Sidcup, Tunbridge Wells, Tonbridge, Orpington, Ashford and Faversham. Please contact us on 01202 259187 if your need Website Design, Web Support or SEO Services.